Del Vance’s Beer in the Beehive: A History of Brewing in Utah is a book that has more than a little in common with its subject. Begun as a homespun labor of love, the book was produced, not by a seasoned writer, but the founder of Uinta Brewing Company. Published by Ken Sander’s Dream Garden Press in 2006, this lavishly illustrated and highly informative volume has enjoyed astonishing success. I recently tossed Vance five questions regarding the writing of this surprise hit. SLUG: Beyond your initial research, what has the reaction to your book, either positive or negative, taught you about Utah and its relationship with beer and other controversial pleasures? Vance: My first reaction was one of shock. I couldn’t believe I sold out of all the books within a year. I printed the minimum run of 1000, thinking they would last for a few years, and they were gone in less than a year; I guess that would be considered an extremely positive reaction! It shows that Utahn’s really do care about good beer and local history. SLUG: How has your image of Utah and its history in general changed as a result of writing this book? Did beer open a window onto a new view of Utah? Vance: I’ve lived in Utah long enough to know that when the subject of alcohol comes up, people on both sides of the issue take notice. I’m sure non-drinking Mormons enjoyed the book as much as beer drinking slobs, such as myself, did. My image of Utah hasn’t changed one bit since writing the book, that’s mostly because Utah’s image hasn’t changed at all as a result of my book. The state still has its goofy image when it comes to alcohol policy. My book can’t change that, only the legislature can. The only surprise I encountered while researching the book was the amount of brewing and distilling activity there was in Utah over the past 150 years. I had no idea Utah was such a powerhouse in the alcohol production industry before writing the book. I met several collectors who have extensive amounts of brewing memorabilia from over 100 years of Utah brewing. Many photos of these items are in the book. SLUG: Did researching and writing about beer alter your palette or enhance your appreciation of beer? Did it enhance any other aspects of your life? Vance: It’s the other way around. My palette was enhanced a long time ago by the great beers brewed by the new emerging craft breweries in the Pacific Northwest. I became so interested in the brewing business that I decided to try it myself. 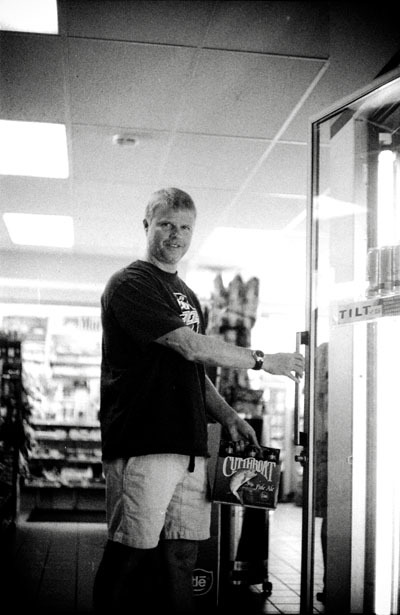 My friend Will Hamill and I liked craft beer so much that we opened the Uinta Brewing Company in 1993 to introduce more consumers in Utah to the great taste of locally brewed beer. My love for good beer and my desire to introduce it to more people was one of the major reasons for writing the book. If any part of my life was enhanced by writing the book, I would have to say it was my computer skills. I had to figure out really quickly that putting a book together takes a lot of computer knowledge, something I’m lacking. I was lucky enough to find Jason Gowans, who is a computer genius, and convince him to help me put it together. As I recall, a lot of good craft beer was consumed during the layout design of the book. SLUG: What other areas of experience do you feel might be enhanced through information gathering and education? Vance: One of the most interesting experiences in the information gathering part of the book was the reading of the old minutes from the Great Salt Lake City Council meetings, 1851 through 1884. They were all written by hand and documented – all the debates, fights, arguments, disagreements and opinions of the council and citizens trying to obtain business licenses. It amazed me that somebody was able to scratch down all of the words from these frenzied meetings by hand. I would say they are one of the best sources of information, on any historic subject, available to people today. SLUG: What frustrations did you encounter while writing this book? Did you experience blocks? What rescued you from abandoning your project and helped you see it through to completion? Vance: The biggest frustration, other than running out of beer every now and then, was the amount of information I found. It was more than I ever expected – I couldn’t seem to stop finding more stuff. I felt like the book was never going to be finished. I never expected it be even close to the 320 pages it ended up being. I could have kept going to over 1000 pages! I’m updating the book for a second edition printing this summer. It’s looking like it might reach that number. I’m going to have to get a good editor. Since its initial release, Beer in the Beehive has sold through multiple editions and is currently unavailable. Keep an eye out for used copies at local used bookstores and enjoy the results of brewer Del Vance’s day job wherever I products are sold.